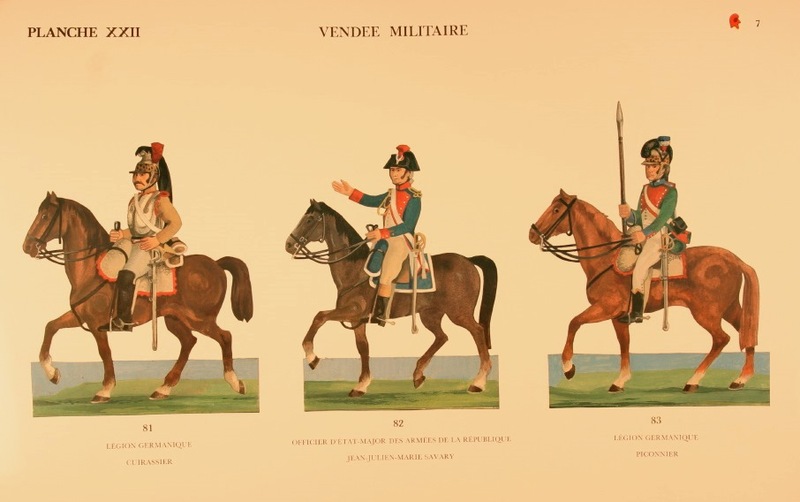 I am working on a French army for the Vendee, and am trying to find any information on the "Light Cuirassiers" of the Legion Germanique in 1792-93. The uniform for the infantry, lancers and artillery is available, but I've not found anything on the Light Cuirassiers. 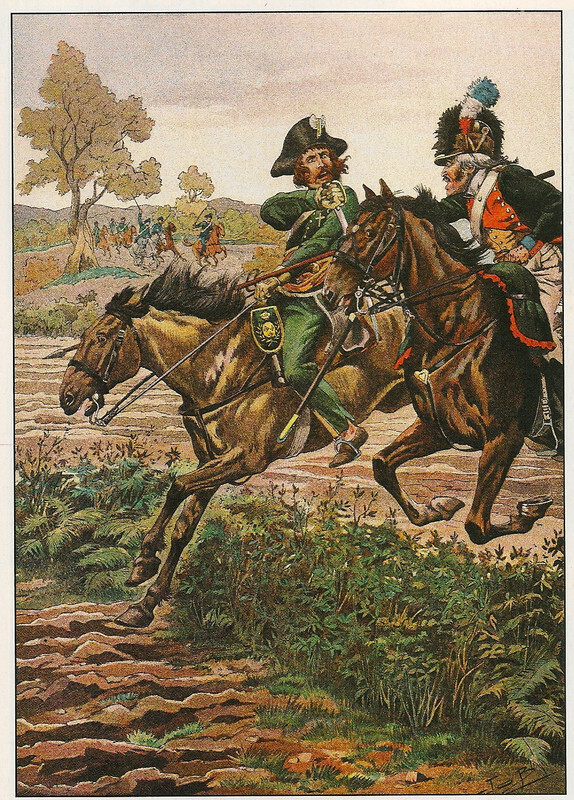 Rob Harper's new book – "Fighting the French Revolution – The Great Vendee Rising of 1793" describes them as wearing a buff coat, a metal helmet, cuirass and arm protection, further stating that the Vendeens weapons would do them no harm, so they would move aside as they charged and then leap on the horse to dismount them and then to dispatch them. Does anyone have any information or a source they can share on this unit? I am also assuming that the battalion of Arquebusiers were a line battalion and not a light infantry one. Should be available for download. Also there should be a plate by Lienhardt and Humbert about different Legions including this unit. Gentlemen, This is excellent material which I could not track down! I do have the L&H plates for the French Legere of the time, but felt it was lacking since it doesn't show the armor or helmet. Now I have something to work with. Were the Light Curiassiers heavy cavalry, medium or lights? Any thoughts if the Arquebusiers were a line or a light battalion? about the armour and helmet of the cuirassiers, there remains still a lot of speculation, see the eye witness in the excellent article which Marbot Chasseurs had linked. Dambach seemingly had the idea to give armour like that of Schauenburg Lippe in the 7YW. Also a musket of new construction was planned, which however never went into proorduction. As if Arquebusiers being light infantry, I would guess yes – unfortunately I did not find a remark on them – see blow. La Legion Germanique ou des Germains (par Artur Chuquet, Paris 1904) transl. The light Cuirassiers had a special uniform. A Helmet very similar to that of the schaumburg-Lippe Carabiniers in the 7-years war. Cuirass from COPPER (!) for troopers and gilded copper for Officers, coat and soubreveste chamois, cloak, boots with spurs. 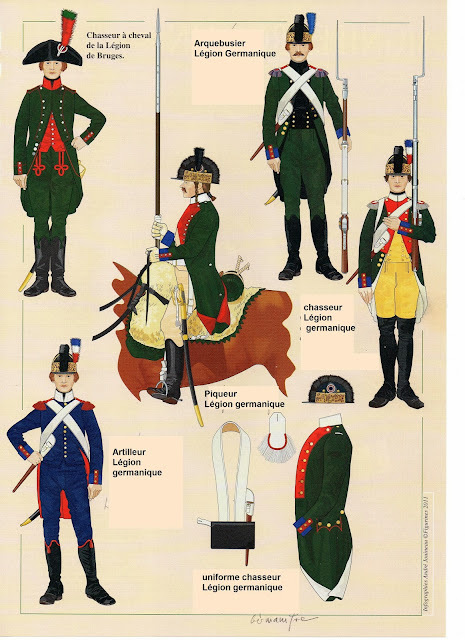 The uniforms of the cuirassiers legers, created on personal request of colonel Dambach, differs in contradiction to the other Legion units very much from the usual appearance of the contemporary uniforms. This really experimental uniform and equopment seemed a personal „hobby" (loisier) of Dambach, who promised the war ministry that 300 of his light cuirassiers were able to rout 2000 line cavalry. Also tha arms were to be completely new invented ones. Article IX of the decret of the 4 sept.1792 mentioned this expressivly, as the Assemble Nationale ordered the provisorial distribution of „common" – here „normal" arms (herkömmlich-ordinary in the german text) as the production of the newly invented arms will take some time! These special models were supposed to be produced in the Lüttich arms factories, but they never reached the Legion, as they were captured by the austrians in spring 1793. 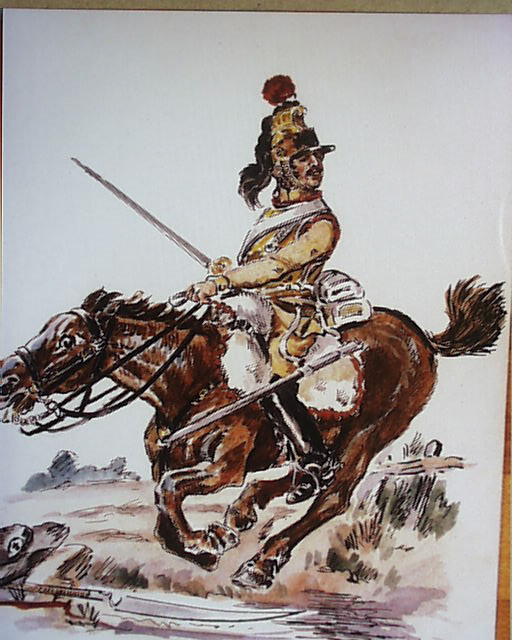 Along with the eye witness of the royal and catholique army I wouldn't opt for a dragoon like helmet but more like that one of Schauenburg Lippe. Let's see if I can find a picture of that formation. Nous croyons que ces soubrevestes étaient des plastrons défensifs en buffle." Les armes que j‘ai adoptées, écrivait au ministère de la guerre le citoyen Dambach commandant supérieur de la légion, et qui ne sont pas usitées en France demandent surtout la connaissance d‘une tactique très profonde et d‘une pratique consommée. Leur formation est combinée de manière à se soutenir respectivement. Les cuirassiers légers sont de mon invention. J‘ai mulitplié pour ainsi dire les êtres, en fortifiant les individus, et dans la disette actuelle des chevaux, j‘ose assuerr qu‘ils sont de la plus grande utilité. Avec 600 cuirassiers légers, j‘attaquerai toujours avec succés 3000 hommes de cavalerie, j‘en prends l‘engagement le plus solennel." La recette grâce à laquelle le Citoyen Dambach avait trouvé le moyen d‘alléger ses cuirassiers, continue le carnet de la Sabretache dont nous extrayons ces lignes (T2, 1894, P369 et 370) a malheureusement disparu avec lui, et semble un des éléments les plus mystérieux de cette „tactique très profonde"qu‘il s‘attrbuait bénévolement à lui-même. Coiféfs de „casques mécaniques" d‘un modèle nouveau, leur armure garantissait non seulement la poitrine mais aussi les bras et les cuisses, tandis qu‘un autre témoignage sur ce curieux corps de cavalerie ferait croire que les chevaux étaient couverts d‘une cotte de mailles. Indépendamment des lanciers, arme disparue depuis le maréchal de Saxe, les cuirassiers de la légion germanique portaient des espingoles, et Dambach, décidemment homme d‘invention avait commandé pour le reste de son infanterie, en Angleterre et à Liège, des fusils d‘un système inédit, mais qui ne partirent jamais, même du lieu de leur fabrication. Ainsi équipée, tout au moins sur le paier, la Légion Germanique dut se rendre à l‘armée du Nord. very nice, the text of the plate is interesting, in my view Dambach was inspired by those carabiniers – despite their name – they were used as light cavalry. The arm protection on both shoulders and arms as seen on the carabinier were abolished in 1758 there they were found unpractical. The eye witness in the Vendée just describes a helmet similar to those as depicted in those illustrations, I would opt for that as head dress. the eye witness describes that the helmet protected the shoulders as well – so maybe the Cuirassiers of the Légion had a similar shoulder protection as the original Karabiners of Schauenburg – Lippe. Marceau writes in a letter to his sister that he needs a silver (sic) helmet, so I wouldn't use a black one but of steel. il est venu sur nous des cuirassiers de Paris, moulés depuis la gorge jusqu'au cercle de la culotte et qui avaient un bonnet sur le casque qui couvraient leur tête jusque sur leurs épaules et tout garnis en fer derrière et devant. Which more commonly available figures might be the closest proxies? well I usually game in 6mm which makes the task easier, but really in whichever scale anyone wishes to offer an opinion for, and I will work from there. Totally EXCELLENT! von Winterfeldt, this is truly excellent material and exactly what I was hoping for. 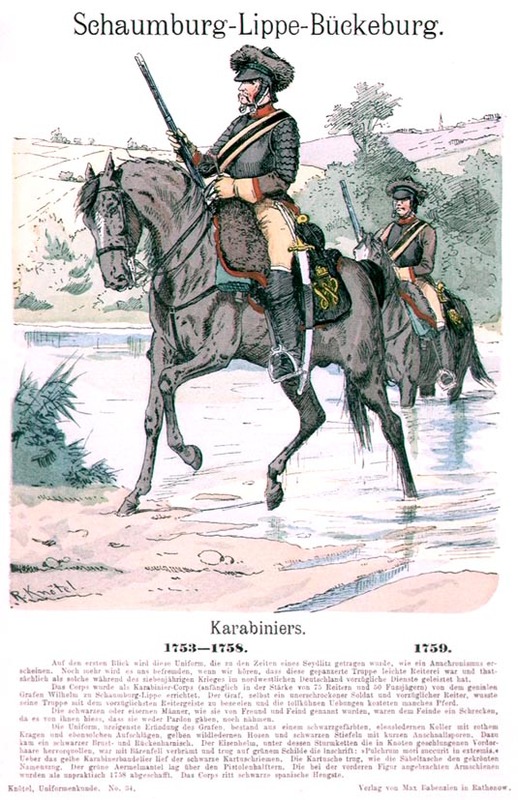 I also agree that the look of the Schaumburg-Lippe Karabaier (I have the original Knotel plate of him in my library) without the fur around the helmet is the more the correct look. And, more what I had in my mind. I do not see them looking like the Cuirassiers of the 1804 forward period. I also think the leather cuirass might be clouded if the cuirass was copper colored, as leather would not be much protection except maybe from sword cuts. I lean more toward the copper colored cuirass with a white metal helmet, with a plume. I game in 15 MM, and Essex makes a very close match in their Renaissance range of a German Reiter armed with a pistol so that should work nicely. Also, I notice that the one references states the Chasseurs were as Light Infantry, but does not Mention the Arquebusiers. That, plus the fact that the Chasserys are wearing pointed lapels of Light Infantry, the Arquebusiers are wearing square cut lapels like a line regiment. I know this is not conclusive, but just the fact they are titled differently and dressed differently leans me toward a line type battalion. Of course their dress is very much like that of a Jager unit too???? Thank you all for the excellent information! For the Arquebusiers – difficult to say, all would remain speculation. 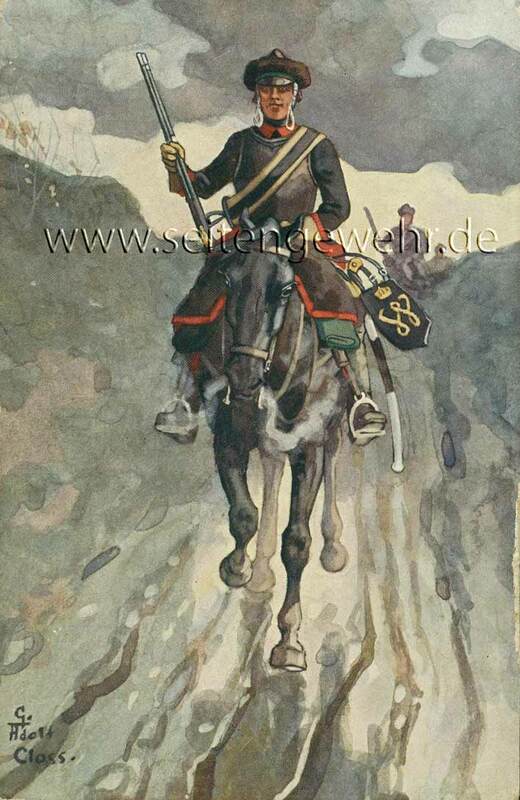 As for the helmet – the eye witness indicates that it had a "cap" on the helmet, it could well be a fur piece as for the Karabiniers of Schauenburg – Lippe – in the end – so far nobody can make a definitive conclusion with the material we have – but a kind of Reiter or sort of 30 ECW new model army cavalry could do. I understand about not as much as we'd like being finite, but you have really given me a substantial amount of data to work from. One description of the helmet also stated a feather in it, which I assume is maybe a plume instead of a feather, but I will at least stick a feather in it. Yes, the figure I plan on using is a late 16th century Reiter figure (Essex MER83) with 3/4 type armor and an open face helmet (I may alter the helmet some???). But as the description says t figure also has upper arm guards and thigh guards. So given a buff uniform where it shows, black boots, and copper body armor with a steel helmet should make for a very interesting French Revolutionary War element. Of course the unit got all but wiped out at Saumur I think it was, but I feel OK using them. Again, sincere thnaks for you excellent help! 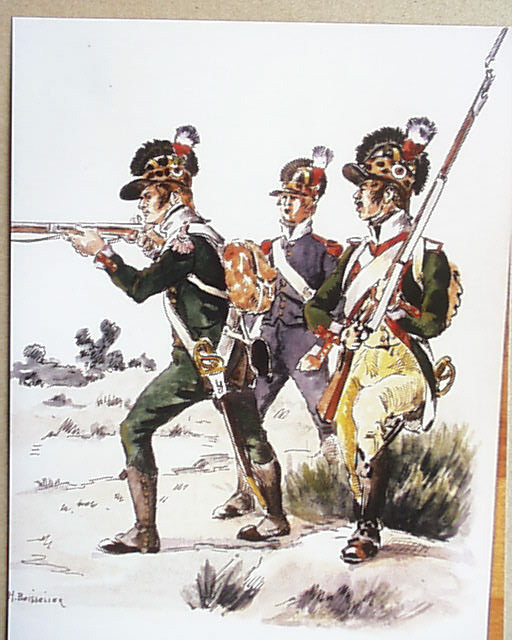 Reading Chuquet – the decree that formed the legion says Chasseurs as light infantry (infanterie legere) but the arquebusiers as infantry (a l'infanterie) – so would conclude that the latter would be line. The lancers were mounted on dragoon horses and the cuirassiers on cavalry horses. See page 277 Article I Clause IV. Wow, More excellent information! Thank you!!!! I am about half way through Rob Harper's new book, and find it most helpful and very interesting. If he's not a wargamer, then he should be, as I find the text very appealing as a gamer. I have learned a considerable amount about the theater, that was vague to me before. The figures I am using for the cuirassiers come with thigh and upper arm armor, but I might see if I can file it off. If not, mine will be wearing it. Or, I might look at a head swap. I will paint my Sho Boki French line infantry as Arquebusiers, will be a nice project, indeed to re create this interesting Legion. I am using Essex French line in the helmet for mine.